Working at a career or job is the most common way we manifest our dreams and passions into physical reality. Putting our intention into action is what we call work. After obtaining and applying talents and education that relate to our chosen profession, we desire satisfaction in our work life. In this culture, our intention to obtain food, clothing and shelter propels us to go to work, get a job, or establish a business to make money to buy what we need. In these challenging times jobs seem hard to come by. Our businesses may find income scarce. Feng Shui Secret Tips can give you an edge after making sure you meet the qualifications for your desired career. Place a job wanted ad in 9 different locations. These may be on-line like Craig's List or sites that feature your desired occupation. Try periodicals, flyers, job placement companies etc. Reinforce your intention to find the work you seek with the Three Secrets. Work in your life may be self-employment, running you own business, working for someone else, or even volunteer work. Following your dreams and passion is the secret to feeling empowered in your work life. In order to discover work we love and are good at, we must look deep inside. Some hear this call when very young. Others (affectionately called late bloomers) spend time in confusion, not finding meaningful work until later in life. If this speaks to you, have compassion for yourself. You are already on your path to discovery. Feng Shui Secrets can help! 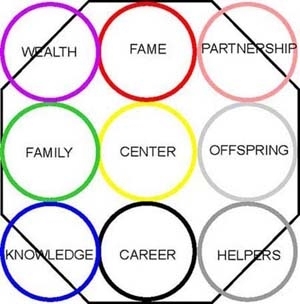 Step 1: Identify your career area in your living space by transposing the Feng Shui Bagua over your floor plan drawing as illustrated. Step 2: Find your personal patterns held in that life situation. How is the room used? Is there a table collecting clutter? Is the front door there? What is the first thing you see? Do you work from home? Do you work from your car? Do you have a home based business? Do you have an office away from home? Pay attention to everything. This is valuable information. Step 3: Begin to empower this life situation area in your living space with any of the following Feng Shui adjustments. To create clarity concerning work that follows the path of your heart, clean all the mirrors and windows in your career area. To get your business moving move 27 things you haven't moved in the past year to a different location. When looking for clients or work greet one new person a day for 27 days with no complaints or requests. Expand your vision by placing a small round mirror under your pillow. To enhance your work flow place a small solar water fountain in your career area. You can also hang a faceted crystal. Request an online Feng Shui Consultation. NOTE: Adding a 3 secret reinforcement to each Feng Shui Secret further empowers your actions. Feng Shui is not a religion, however it does recognize the spiritual dimension in all things. It is compatible with all belief systems and all living situations.